originally Pollarding was used as an alternative to coppicing (cutting a tree to reshoot from ground level) as the higher regenerative growth prevented it from being eaten by cattle, deer, horses, etc. 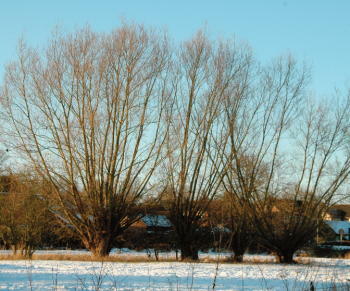 Traditional Pollards can still often be seen in leicestershire in particular with willow trees growing alongside streams. when selecting a tree to be pollarded the younger the better is the general rule of thumb, most deciduous broadleaved species will reshoot and with repeated careful re-pollarding (removal of the re-growth) a lumps of callous tissue will develop at the end of the branches. These lumps or pollard heads are able to reshoot more readily than normal branches and as time goes by will respond with more vigorous re-growth. care must be taken not to cut into the pollard head as this will reduce the ability to re-shoot and will also open the centre of the pollard head for attack by decay fungi. some species, in particular lime trees, will reshoot along the stem as well as from the top following pruning. in this case the side stem growth can be removed to create a clear stem. Re-pollarding is a very cost efficient management technique which takes very little time per tree to undertake. it should be undertaken when the tree is dormant so usually november – february, depending on the weather... if pollarding out of season the tree is likely to respond but repeated pruning can weaken the trees health in the long run, so it’s best to plan ahead and consider how much re-growth will occur during the growing season. care must be taken if trying to Pollard a large / mature tree as the stress to more mature trees can kill the tree, or allow pathogens such as honey fungus gain to an upper hand. There are techniques which can be employed over multiple seasons to work a large tree into a pollard if there is no other option. if a tree hasn’t been re-pollarded for some time then care must be taken with the management as the growth can often fail or pockets of decay develop at the base of re-growth. This would be the case with the Traditional willow Pollards if left unmanaged the damage caused by failure would likely be irreversible. Modern times have seen more use of pollarding in the urban environment. The victorians were keen on Pollarding trees around the city at 4-5m high with a single stem. 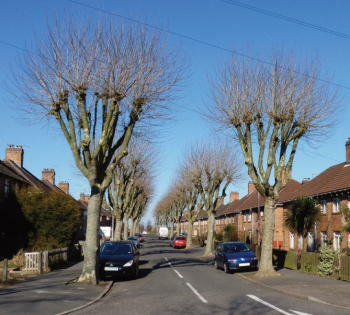 The london Planes shown in the photo may well have been previously maintained at the top of the trunk, then again 1.5m above that point, before the current height was selected. here the matching size and shape of the avenue gives greater strength to the planting. in winter the form is clear to see, however summer gives a solid green mass of leaves with little light penetration. we often use pollarding to create screens such as the Eucalyptus in the photograph. here the trees are pruned to just above fence height in february every year and then the re-growth of up to 12ft offers good screening during the summer. Pollarding like this can give an excellent alternative to hedges, particularly if the screen is required quickly.